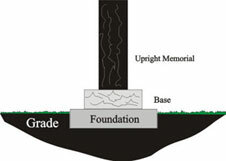 Usually set flush with the ground, foundations are not required but the marker style may be placed on top of a foundation. Usually 6" thick at the top end tapering to 4" thick at the bottom end. 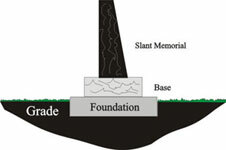 Bevel markers usually require a foundation depending on the rules of the particular cemetery. A granite base may not be necessary but it is recommended as it raises the marker to help protect from possible damages due to lawnmowers or other devices. These are thicker at the bottom and taper to the top. Usually 6" or 8" thick always placed on base stone which is then placed on a foundation that is usually 4 to 5 feet wide. These are available in many shapes - both standard and custom. Copyright © 2007 Young & Yaremchuk Memorials. All Rights Reserved.